An early Saturday morning commute, overtime bound. Fresh fallen and still falling powder blowing past and thrown up under Jake’s wheels to encrust my legs. Gloriously vacant streets. Few car tracks. No footprints. No bike tracks. Clear, unridden snow down the LRT trail. I’m the first out and pass no other tracks until Mill Creek where I follow one single bike line up into the broad path through the trees. Riding home at noon on the road the snow is half-packed by cars and I make constant corrections as the skinny, unstudded 35s skid and slip looking for purchase. I conciously loosen my tight grip on the bars and relax. ﻿﻿﻿﻿﻿﻿My course is like a drunkard’s walk. After 20 snowy kilometers Jake wants more but duty calls. Momma’s sick and the children need minding. I am truly relishing the slow return of the sun. Pedaling home by the stark light of the late afternoon sun is so much preferable to toiling away in the dark with all lights flashing. 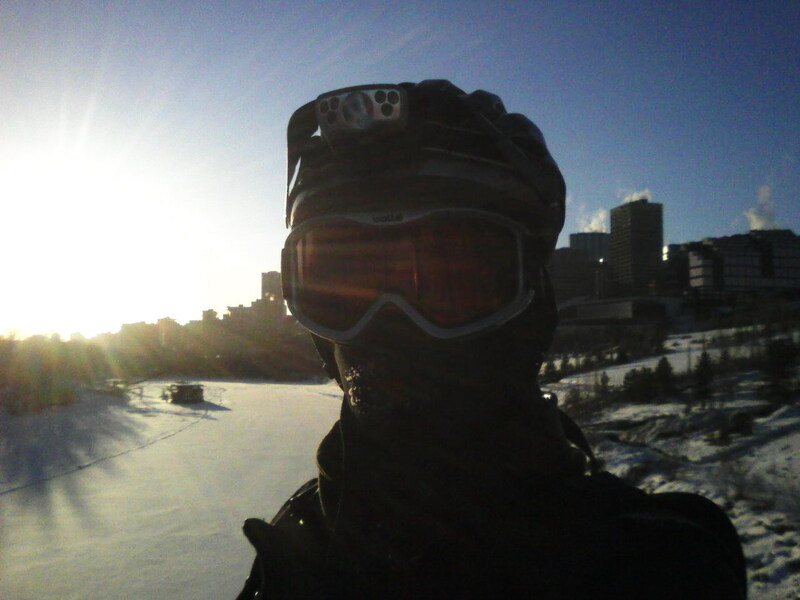 It made a breezy -22°Celsius ride pleasant. 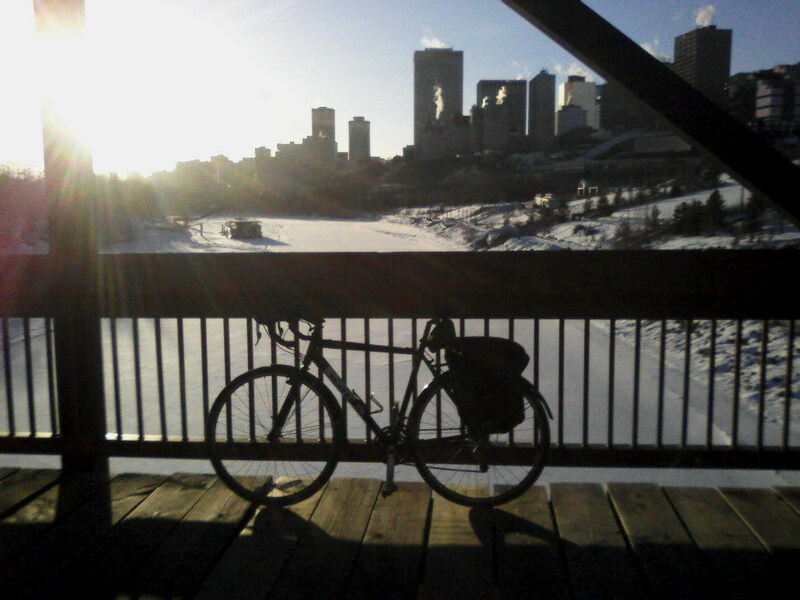 I even took the time to stop and snap a couple of photos on the pedestrian bridge over the North Saskatchewan river. I only had my rather poor cellphone camera to use. The impulse to photograph while riding arises so often that I really should get a decent camera to take with me. After all these years living in Edmonton I still am struck by all the buildings venting steam on frigid days. It looks like a city afire to warmer climate East Coaster like myself. Since I’m doing some maintenance on my winter bike I’ve been riding my Kona Jake for the past few days. It’s a much sweeter ride than my lumbering, studded-tired, stupidly heavy mountain bike. 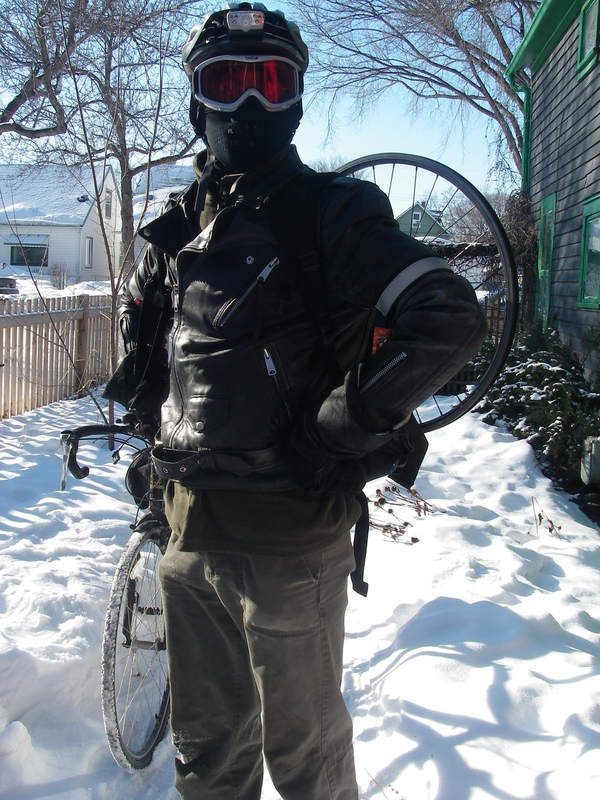 I like it too much to subject it to a full winter of riding, though. Next week I plan to be back to the winter bike. I recently decided that I was at risk of becoming a bore to those around me with all my cycling babbling. So, I am moving it onto a blog and with luck like-minded folks will find it worth reading. I’ll be writing abouts bikes, commuting, and utility cycling and for a change of pace maybe a bit about music. If you’re unlucky I might speculate on the meaning of life, the universe and everything.